NOTICE: Activation key must be used on a valid Steam account, requires internet connection. ABOUT THE GAME	The successful Bridge Constructor series - with over 30 million players worldwide – treads new paths with Bridge Constructor Stunts! Stuntman and engineer in one? No problem with Bridge Constructor Stunts! Build imposing ramps and loops to reach your goal in the diverse stages. B… ut building structures alone isn't enough this time: you sit behind the wheel of the vehicles yourself and have to maneuver them skillfully to the goal. Collect stars, complete daredevil jumps, flips and spectacular stunts, leaving behind a trail of destruction across the entire level to beat the high score. But you can only do all that with perfectly constructed bridges and ramps.Join the huge Let's Play community	To ensure none of your jumps are forgotten, you can save your runs as videos and GIFs, directly upload them to GIPHY and share them with your others (video export and GIF upload functions for Windows version only). Let the world be part of your most outrageous jumps!Improved Construction Mode	Once again you have access to a variety of building materials with different properties. Numerous improvements make building even easier: simply click to convert a beam you have built into road, and vice-versa. Click and hold on a part of the construction and you now have the option to reposition your structures without having to build them from scratch.Loose Screw! We have hidden some hard-to-reach screws in some of the levels. Find and collect them, and you might be able to put these screws to good use in the future...KEY FEATURES The latest instalment in the internationally successful Bridge Constructor series! 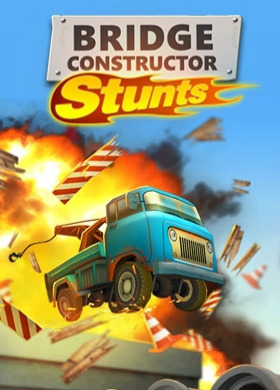 Improved and simplified Construction Mode	Build ramps and drive vehicles across them yourself	Diverse level with different objectives: collect stars, score target, reach the goal…	Delivery vans and dump trucks with cargo that wreaks havoc when coming loose, but is also useful to help you collect items	Various building materials	Spectacular stunts and rampages of destruction	Achievements and rankings	Replay feature and video/GIF sharing: save your best bridge crossings and stunts and share them with your friends (video export and GIF upload functions for Windows version only) Controller-SupportSYSTEM REQUIREMENTS WindowsMinimum: OS: Windows XP, Vista, 7, 8 Processor: 1,8 GHz Memory: 1 GB RAM Graphics: DirectX9 compatible with Shader Model 2.0 Mac OS X Minimum: OS: Mac OS 10.6 Processor: 1,8 GHz Memory: 1 GB RAM Graphics: DirectX9 compatible with Shader Model 2.0SteamOS + LinuxMinimum: OS: Ubuntu 12.04 or equivalent (32bit or 64bit with ia32-libs installed) Processor: 1,8 GHz Memory: 1 GB RAM Graphics: Linux 64bit users need to have ia32-libs package installed (sudo apt get install ia32-libs) (c) 2016 Headup Games GmbH & Co. KG, all rights reserved, www.headupgames.com, ClockStone and its logos are trademarks of ClockStone Software GmbH.